You are here: Home / 2015 / March / Can products from synthetic biology be sustainable? Can products from synthetic biology be sustainable? Last year, Ecover made a courageous decision. It decided to kick out palm kernel oil (widely known for its shaky sustainability) as a feedstock for many of its detergents, and replace it by a bio-equivalent oil produced by engineered algae. And not only did Ecover decide to do so, it also decided to communicate this decision – including the synthetic biology bit. Even though the supplier, Solazyme, that used to describe itself as a synthetic biology company, now contents itself to communicate on its website that it uses ‘breakthrough production processes’. This is the fifth article in a series on public acceptance of biotechnology in food production. The articles appeared on 18 February, 2 March, 3 March, 10 March, 15 March and 27 March. Will Ecover be able to carry through its project of the use of vegetable oil, produced by genetically modified algae? 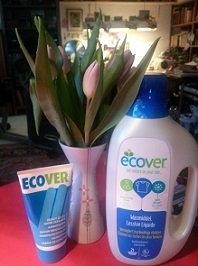 Ecover is one of the leading companies in the world that promote sustainability. Its public image can sustain a blow. It is in permanent consultation with NGOs like Friends of the Earth that are very sceptical about synthetic biology. Under their pressure, Ecover has postponed the use of this particular algal oil. Talks between parties do go on. Ecover’s long-term innovation manager Tom Domen says that they would like to keep this process as transparent as possible, and that proponents and opponents should get equal treatment in the forum. The company must be lauded for its openness. Whereas others, including Solazyme, have become very hesitant indeed in their communication. We’re talking synthetic biology here. We do not promote synthetic biology in crops that grow on the land, and restrict ourselves to genetic modification of microorganisms (bacteria, yeasts, fungi, algae) that live in reactors. Researchers take precautionary measures to prevent these organisms to escape – and should they nevertheless escape, minimise their chances to stay alive outside. The big difference with genetic modification of crops is that the modified genes will not end up in our food, our skin creams or detergents – they stay in the reactor. More or less, industrial use of such modified organisms has been publicly accepted – that is to say: their use has never been challenged. But synthetic biology is one step further down the line of genetic modification. In ‘ordinary’ genetic modification, researchers take a gene from one organism and implant it into a host; thus inducing the latter to produce, say, lactic acid or even penicillin whereas it normally would not do so. But in synthetic biology, genes that do not exist in nature are designed in the computer, and then produced in the lab and introduced into the host. Synthetic biologists therefore design and produce genes that never existed. Thereby enlarging massively the spectrum of possible industrial products, but also alerting groups that were sceptical of GMOs already, calling this technology ‘extreme genetic engineering’, like Friends of the Earth do nowadays. 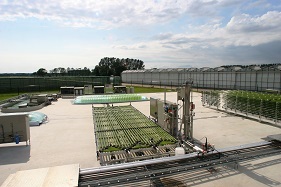 Will vegetable oils produced by genetically modified algae (here: Algae Parc Wageningen UR) become the feedstock for our detergents and possibly even our food? Can the products of synthetic biology be sustainable? It depends on your definition of sustainability. Probably, the Ecover detergents using Solazyme’s algal oil are less detrimental to the rain forest than those based on palm kernel oil – depending on the feedstock for the algae (algae feeding on waste will have a smaller footprint). Also, the fermentation that takes place in such microorganisms typically uses less energy and resources, producing none or at least less harmful emissions and leaves less waste than competing fossil-based production processes. But if ‘natural’ should be your yardstick, all these achievements could be offset by the mere fact that such processes are aided by synthetic biology. Synthetic biology develops at an unprecedented pace. Twenty years ago it did not exist, yet now it is used in many industrial processes. Often, it is not clear if the use of synthetic biology should be labelled on the product. Calling products ‘natural’ that are produced in this way, as Evolva does on its biotechnologically produced vanillin, may be pressing one’s luck – but it is a clear example of the terminological lack of clarity in this area. To which there is just one remedy: a public discussion on these issues. But the public has hardly been informed at all, so far. Most companies involved do not show their cards. They hide behind vague formulae like ‘we have passed the muster of the Environmental Protection Agency’, ‘our ingredients are generally recognized as safe’, ‘our product is derived from a fermentation process involving sugar cane’. Most openly, ‘we use both natural strains, classic breeding, and strain selection, along with the tools of modern biotechnology, to produce a wide variety of oils and ingredients’ (Solazyme to the New York Times). Issues in this area become increasingly terminological. The New York Times had to correct its article on synthetic biology, no doubt because of the intervention of government officials, because it had written that the field was ‘largely unregulated’. Although it was still allowed to assert that ‘the regulatory oversight of products from older genetic engineering techniques may not apply to the products of some newer techniques used in synthetic biology.’ So noted. But it is still a far cry from information of the public on these issues, let alone a public debate in this rapidly evolving field. So, to reiterate the answer to the question posed in the heading of this article: yes, products of synthetic biology can be sustainable, even very much so, and even if they are used for food – but everything depends on your view on sustainability. Your very description of solazyme is wrong. Solazyme utilizes known genes found in other organisms and therefore qualifies as “ordinary” genetic modification per your article. The only ones claiming solazyme is using synthetic biology are the agenda-driven activists like Friends of the Earth and ETC Group and their supporting allies. So, we were mistaken in the opinion that Solazyme uses synthetic biology to produce its algal oil that Ecover wanted to use. We assumed that on the basis of communication of Friends of the Earth only. We apologise to our readers and to Solazyme for that. This article would have been great had you actually attempted to answer the title question. What exactly was the point in your title? You seem to do everything you can to *not* answer the question of whether the products produced from synbio tech are or could be sustainable. No, I’m sorry, whether a person will or will not use synbio products based on a misguided faith that these products cause harm to our health has nothing to do with sustainability. The question is, assuming people were willing to use these products, would they be more sustainable than the alternatives? For instance, Saffron is one of the most expensive spices, and a very labor intensive product to produce naturally. Syn Bio can, at least partially, replace this ingredient, thereby requiring substantially fewer resources to produce it. Less land to farm it. Fewer people to farm it. Less energy to transport it across the world, etc. It is a much more environmentally sustainable product. The Palm kernel algae alternative definitely is more environmentally friendly. Frankly, organizations like Friends of the Earth are not ok with destroying the habitat to farm PKO. However, when given an alternative, they will insist that PKO farming is still better than syn bio because syn bio takes jobs away from PKO farmers. Since when is it ok to support farmers that destroy our earth? I don’t care if they lose their jobs. Find a job that doesn’t destroy the planet!